Despite Computex not officially starting yet, I am spending most of today in the Gigabyte suite. Before my booth tour I took a quick look around and a couple of little devices caught my eye: Kabini (and Haswell) in a BRIX. So BRIX is Gigabyte's take on the Intel NUC, and the first designs of BRIX could be found on the web a while ago - the first models with the BRIX design should be on sale shortly, with these Kabini and Haswell models to follow. The Kabini model was placed with a list of compatible APUs: A4-5000, E3-3000, E1-2500 and E1-2100. Similarly the Haswell model is placed next to a sign stating compatibility up to an i7-4500U. 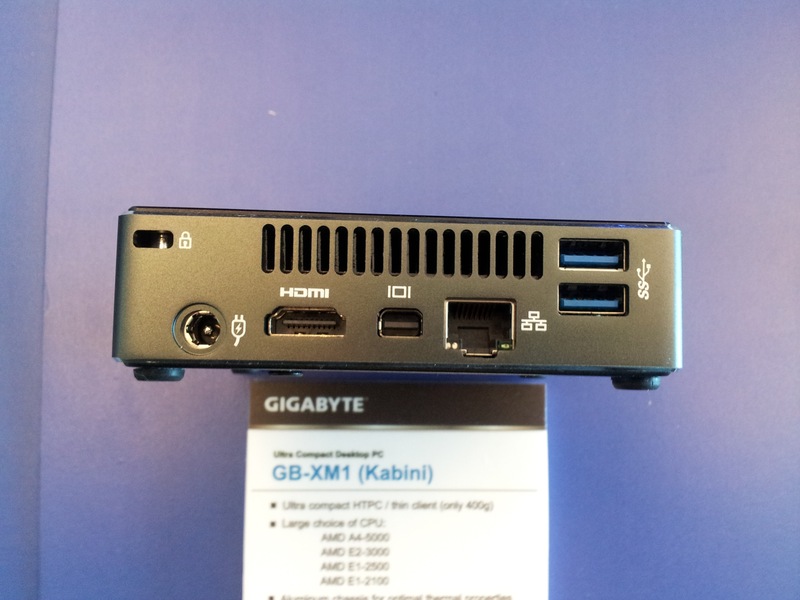 Connectivity includes a pair of USB 2.0 (not shown above), headphone output, two USB 3.0, ethernet, dual display (HDMI/mDP) and a Kensington lock. Clearly the ideal chip in this form factor would be a GT3e/Crystallwell part. I am having a full guided tour of the booth later today and will ask questions such as storage, price/release date, and hopefully some internal shots! Got any shots of what the internals look like? Loving the headphone output, mini DP and fingers crossed for a GT3e/Crystallwell park. Depends on who you are, why you need it, and what you're willing to pay for it. Lots of users have paid more than they should have on iPad's ($900+ for an iPad?) on a yearly basis. Paying $700 for a tiny box that has a decent gaming box in it that you can throw in your bag might be worth a laugh to those. The fact that the GT3e-quipped chip itself is going to be niche shouldn't be a stopper since... it's a niche product in and of itself. Why is it a niche? Because Intel makes it so. Clearly, they aren't making many of them, which is why the GT3e is so rare in the lineup. This is their test run for next year when that cache will explode across all the lines, which is also why Intel is being rumored so heavily to be skipping LGA with next year's update (which may well end up making this year's update look incredible if we all thought this year's update was bad for the desktop). Definitely more interested in the Kabini variant. 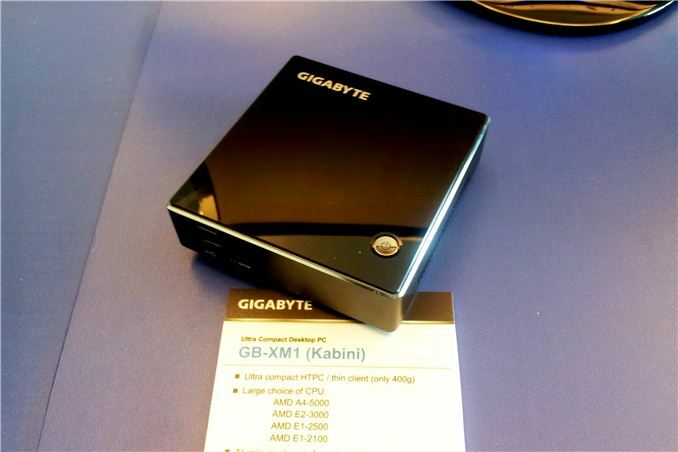 Kabini should be more than adequate for HTPC use, and it should be quite affordable. While a Haswell/Crystalwell part would be swell for performance, that'd jack up the price to an unreasonable level, as far as I'm concerned. Could you add some photos of the power brick? Thanks in advance.